​Two artists teamed up to create the current exhibit at Crowsnest Pass Public Art Gallery. Sarah Bing and Mali Vargas, both based in Calgary, came together to present the visually stunning and conceptually intriguing show, The Road To ... The seeds for the exhibit were planted after Sarah returned from a road trip through the Rocky Mountains with her family. “Sarah approached me about developing an exhibit based on her excursion,” explains Mali. The project was a challenge, she says, because they agreed to certain parameters in their joint undertaking. Both artists would base their work on photographs Sarah had taken, but would not tell each other which photos they had selected. They would also avoid speaking to one another about style, approach or technique. Finally, they agreed that when the time came, they would meet with all of their completed work and decide how to exhibit it. ​Their work has been on display at Northern Alberta Jubilee Auditorium, and Mali says she was very happy to have the exhibit accepted at Crowsnest Pass Public Art Gallery. “I have visited the gallery before,” she says, “and I really love the space.” Mali adds that the gallery is an attractive venue for artists, thanks to managing director Krisztina Wood. “The approach that Krisztina has to art and to different mediums and discourses is very open, and that’s appealing.” The Road To ... remains on display until Nov. 23. Crowsnest Pass Public Art Gallery is located on Highway 3 in Frank, and admission is free. The latest artist featured in the Sheep River Library’s art gallery is not your stereotypical southern Alberta painter. While the region boasts a plethora of artists inspired by the landscape and nature that make the area so beautiful and unique, Calgary artist Mali Vargas gets her drive from colour. The abstract artist hopes her series of acrylic paintings on canvas, called Fluid Nature, will give art admirers an appreciation for a medium that’s out of the ordinary for the area. Vargas’ work will be on display at the Sheep River Library in Turner Valley throughout July. Vargas said these beliefs were verified when she contacted the Sheep River Library about displaying Fluid Nature. “They saw a little bit of my work prior to the artwork arriving and one of the comments was it was so exciting to have some modern art come here because all we get are landscapes and horses,” she said. Sheep River Library manager Jan Burney said most of the art featured in the gallery are landscapes in photography, oil or watercolour. Burney said having Vargas’ exhibit on display offers something quite different. The Sheep River Library has offered various forms of art in the past such as fibre art, but Burney admits most of the art does fall into the landscape and nature category. Vargas said there seems to be a belief in the Alberta art culture that viewers can only handle or understand landscapes and nature, but she doesn’t believe that’s the case. Part of that education comes with showcasing her art in public art galleries, said Vargas. Vargas plans to do some of her own educating during an artist reception at the library on July 19 from 1 p.m. to 4 p.m.
Vargas graduated from the University of Texas with a bachelor of fine arts degree in studio art and delved into pop cubism, which mixes the perspective art of cubism and with the intense colours of pop art, before moving into more abstract expressionism art. Vargas is a member of the Society of Canadian Artists, Alberta Society of Artists and Artpoint Gallery and Studios Society in Calgary. She is also the founding member and program coordinator for Betzalel Arts at the Calgary Jewish Community Center, served on the provincial council for the Alberta Society of Artists and the board of directors of the Women’s Art Museum Society of Canada. Vargas’ work currently resides in private collections in Mexico, Switzerland, the United States and Canada. My two year-old son is going to his first symphony on Sunday. Before the matinee performance of Peter and The Wolf, the Calgary Philharmonic Orchestra is putting on an Instrument Petting Zoo so that kids like mine who haven’t experienced live music can see and feel for themselves the difference between an oboe and a piccolo, a trombone and a timpani. Our city’s remarkable orchestra is constantly innovating like this, striving to make symphonic music more accessible to a broader audience, whether it’s putting on these Symphony Sundays for smaller children or lending their arsenal of talents to performances of music from video games, The Lord of the Rings, or rock and roll bands like Queen. This fun and unpretentious vibe extends to the CPO’s fundraising efforts as well: if you want to, you can adopt your own member of the orchestra for a year, or book a concert for your child’s elementary school. Or, like me, you can drink. Tuesday night kicked off the CPO’s annual Cork & Canvas Art & Wine Festival, a series of a half-dozen fantastic wine-and-food driven events taking place over the next month that forms a key part of the Orchestra’s fundraising efforts for the coming year. Willow Park Wine & Spirits’ Bonaventure location played host to the inaugural event in the program (described in more detail below) and will also welcome music lovers to the C&C Craft Beer Night on Thursday, March 14th and to the Art of Whisky tasting the following Thursday, March 21st. The Cork & Canvas itinerary also includes High Tea at the Palliser on the afternoon of Saturday, March 16th and a classic French luncheon at La Chaumiere on Tuesday, March 19th, and it wraps up in style on Saturday, April 6th with a Winemakers’ Dinner and Art Auction at the Petroleum Club. Let’s just say that lovers of the finer things will have plenty to do over the next 30 days, all of it for a tremendously good cause. I was lucky enough to help kick off the festivities at the Cork & Canvas opening Wine Tasting at Willow Park, where wine of all kinds was flowing in one of Calgary’s largest and best-stocked boutiques.We were in WP’s hugely spacious lower level, which was ringed with wine and food booths as far as the eye could see. Restaurants (Belgo), caterers (Great Events) and a small army of importers and wine agents (Christopher Stewart, Pacific and about 15 more) were flouting their wares, and at least 200 people were milling between them, glasses outstretched, seeking out their next sample. An array of silent auction goods were laid out in the middle of the room, from original works of art and handmade pottery to trips and vacation stays to 30 year-old bottles vintage port and aged Bordeaux. There was even a salsa dancing demonstration, because, well, why not? We checked our coats, grabbed our complimentary Willow Park wine glasses, and dove in. One of the auction items available included the painting “Into Spring” by artist Mali Vargas. Juan Gil Monastrell, Spain (Christopher Stewart): This is the wine I’ve written the most about in my young online writing career. I’ve sung its praises in Pop & Pour, called it the ultimate comfort wine in Culinaire Magazine, given it top marks as a Secret Santa Christmas gift…let’s just say it tickles my fancy. Bright lush dark fruit, sun-baked earth, a touch of smoke, a touch of heat, and an ultra-sophisticated all-silver label, all for $20. Find one and buy one. Astrolabe Sauvignon Blanc, New Zealand (Christopher Stewart): Christopher Stewart’s booth was on fire at this tasting. The Astrolabe just came off making the list in Wine Spectator’s Top 100 wines of 2012 (it was #59) and was definitely more than just your standard NZSB. Swirling flavours of candied pineapple, lychee, mango, bell pepper and mineral, racy acid structure, and a grippy, almost waxy mouthfeel make this one of the more ultra-intriguing whites I’ve had in awhile. Plus the name sounds like a science fiction movie. Astrolabe! Cooper’s Creek Riesling, New Zealand (United): Possibly the most random pour of the night, this 5 year-old Riesling was a rarity: you don’t see that many vines in New Zealand devoted to this awesomest of grapes. It had a “gas station” nose — petrol, burnt rubber, wet pavement — and a dry, tart, crisp green apple and rubber elastic palate, all a ton of fun for $18. Gonzalez-Byass Apostoles Sherry (Grady): I haven’t had many sherries in my life outside of WSET class, but this one was probably the weirdest, although I mean that in the best possible way. A blend of Fino sherry (which is usually pale, tart and ultra-briny) and Pedro Ximenez sherry (which is usually dark, oxidized, sweet and nutty), this 30 year-old wine was somehow both flavour profiles at once: a steeped-tea colour, incredibly nutty (cashews? ), somewhat salty, somewhat sweet, totally perplexing on the palate. We were told this would be amazing with a salty aperitif, and for $30 a bottle, this might be a hypothesis I’ll have to test at some point. Other wines were less lucky, but anytime you can hold out a glass pretty much anywhere in a huge room and somebody will fill it with something different, you’re pretty much guaranteed to have a fun night. Between the dancing, the food (duck pastrami! 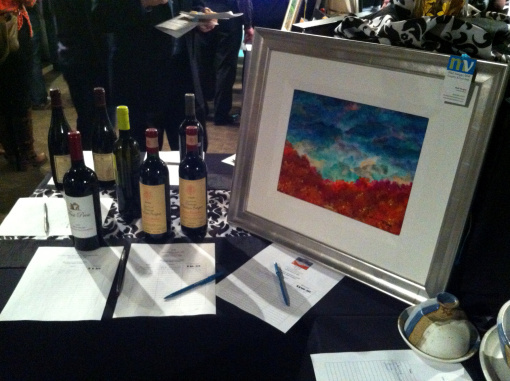 ), the wine and the auction, it was an utterly enjoyable event in support of an even better organization. There is nothing quite like live music. It engages you intellectually and emotionally, transports you to other worlds, and gives you a front row seat to the majesty of human brilliance. We are incredibly fortunate to be the home of a dynamic, talented and engaging philharmonic orchestra, and too often we forget just how incredible a gift that is. If you can, go take in a show, make a contribution, or come to a Cork & Canvas event this month — support your CPO. Let’s talk abstract art and modern expressionism. How often have you looked at a painting and thought “I could do that”? If you are artistically challenged, as I am, and have tried your hand at basic doodling, colour mixing, geometric patterns or any type of conceptual art, you quickly realize that artistic talent and an art education are requirements in these visual languages! As a lover of all types of art, I do have a fondness for the non-conventional. In the past, I have never really analyzed why I like certain pieces, I just know that I like what I see – or not. It wasn’t until I started asking questions at the galleries or of the artists here in High River that I began to learn the concepts behind these forms. There are variations of abstract dating back to its beginnings in the 1800s whereas modern art/expressionism blossomed in the 1900s. Keeping in mind how rigid everything in society was in the 1800s, for an artist to “paint outside the lines” so to speak, was to defy the conventional and bring the wrath of the traditionalists upon his head. The 1900s brought forth artists that wanted to express their emotions through their art as opposed to recreating images. Thankfully, the human spirit to create and grow is something that artists have an overabundance of and we are much more fortunate because of them. The goal of abstract art is to depict an image in a non-representational way without actually depicting the image. Modern expressionism uses colour, techniques and materials to create an expression of the artist’s emotion. As someone who loves puzzles, these are the ultimate visual puzzles. While the artist is attempting to convey an image or an emotion, it is up to us to participate in the unraveling of the artist’s intent. Want to try your hand in some puzzle solving and see some wonderful abstract art and modern expressionism? Most of the galleries here in High River have both of these forms on display. Fortunately there is a wonderful show at Evanescence Gallery, 61-- 8th Avenue SE, which is currently displaying some brilliant work. The artist is Mali Vargas and I must confess I have already purchased one of her paintings earlier in the year. And yes, it was love at first sight and I definitely had no knowledge of the art behind it or Mali’s impressive credentials. To quote from her website “she is concentrating on a series of paintings relating to the emotional expression of sensations based on memories and dream-like qualities. The work is accomplished through the use of intense colors and varieties of stroke and layers”. That said, her work is definitely strong and eye-catching. Do make the effort to see her work at Evanescence Gallery as well as visit the many other galleries in town and see if you can understand the puzzles and emotions presented in these art forms. The High River Arts Society is also having a show and sale at Carlson’s on Macleod until September 25th. This is a great opportunity to hoist a glass to our local artists and add some wonderful art to your home! Creating excitement for a new and unknown event is challenging, but Mali Docktor is committed. As organizer of Art ForMS, an art show benefiting the Multiple Sclerosis Society, Mali started by looking for artists affected by MS, or those who believe in working for a cure. Right away, Mali's efforts struck a chord with Darcy Lundgren, owner of DaDe Art and Design Lab in Inglewood with business partner Greg Fraser. Darcy was inspired to donate his space for the event. "Giving back and trying to make a difference is what it's all about for me," he says. It was soon clear that many felt the same way. Both emerging and renowned local artists responded to Mali's call and the pieces were flooding in. For a moment, it even looked like there might be more artwork than available space. "We were offered so many great pieces, more than I expected" Mali says, "luckily we found space for everything." The inaugural Art ForMS exhibit was held April 22nd at the DaDe Art and Design Lab, featuring prints, glasswork, photographs, jewelry and more donated by local and international artists. Several pieces went up for bid with a live auctioneer, while other work was available for silent auction. Funds raised went to the local chapter of the MS Society, under the banner of Team Docktor, a fundraising group which participates in the MS Society's annual walk and bike events. The team was formed in 2009 by Mali Docktor in honor of her husband Ben Docktor, who suffers from MS.